We are woken at 7:30 am by a phone call from Sharon our friend from Texas who has been trying to ring us all week. We talk for a while and she tells us she will be in WDW in June when her boyfriend intends to propose to her in front of Cinderellas Castle. It fair brings a tear to me old cynical eye. Tam finds it all terribly romantic and as we are already married, suggests I go down on one knee and propose divorce. As long as I get custody of the DVC. We dont mind being woken up a little early, after all today is the first REAL day of our holiday as we are going to a park for the first time today. Everyone is fed, watered and out of the door by 8:45 am. We arrive outside the International Gateway and enter Epcot by 9:00. Our first stop is Test Track to get Fastpasses, but notice that the single rider line is short. We have to persuade Georgia to ride on her own, but as it turns out she rides in the same car as Tam anyway. Next we are off for our obligatory ride on Spaceship Earth. Always a pleasure, never a chore. Over to Journey Into Imagination. We havent seen the new improved Figment version before and I must admit it IS new and improved. Still not a patch on the Dreamfinder version though. The Flower and Garden Festival is on and we are all very impressed with this. The topiary and flower displays are lovely. We do the Doggone Maze and find the wonderful Stitch and Lady & the Tramp topiarys. Even the boat ride in the Land has different plants growing for the festival. 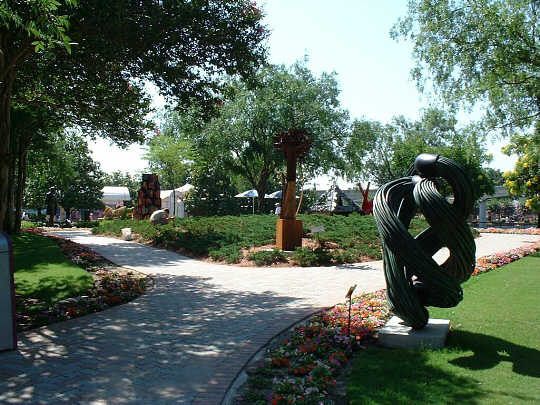 There is also a sculpture garden with relatively modern sculptures. I'm not usually too impressed with modern art, but some of these creations are very pretty. Next is Honey I Shrunk the Audience, which plays to a packed house although the crowds are reasonable in general. Its time to visit World Showcase and we start in Mexico where there is a very pretty orchid display. As you probably guessed, flowers arent really my thing, but the displays throughout Epcot are beautiful enough to impress even the most uncultured, beer swilling lout. Hence, Im impressed. Through Norway via a quick ride on Maelstrom before we settle in China for a while. We watch the 360 degree film, Relections of China and now Tam wants to go to China as well as Canada. Might be a bit difficult to achieve in one trip. Its now 2:00 pm and we decide on a late lunch in the Chinese restaurant. I know that a lot of people say that the food here is over-priced and bland, but all I can say is that our experience was exactly the opposite. Tam, India and I split the sampler for 2, which includes soup, rice, sesame coated chicken, cashew shrimp and spicy beef. Georgia has the kids sweet and sour chicken. Tam and I both have strawberry daiquiris. A bit girlie, but better than paying $4.50 for a Chinese beer that tastes like its been strained through the sweaty sock of a Kowloon docker. With drinks and tip the bill is still only $60, one of the best value meals we have had all holiday. Thats the thing about Epcot, we have been there dozens of times now, but there is always something new to find and experience. After lunch we watch the Chinese acrobats. These little boys and girls are incredible, so supple and athletic. We are starting to flag a little, so decide to take a break and return to the BCV for a swim and a shower. A couple of hours later we stroll back into Epcot. From here on the evening is practically perfect. We first visit France where Tam has an iced cappuccino and I try out the red wine. A stroll to Canada and a beer later and we are ready for Off Kilter. I havent seen them for a couple of years, so I really enjoy hearing them again. Next is the UK for the British Invasion. Those of you that have read my trip reports before have probably noticed that this is a standard part of all our Epcot visits. Tonights crowd is appreciative if a little static. One thing I have noticed is that a pint of Bass in the UK pavilion now costs $7.50. A fiver for a pint of beer? You have got to be joking. Its now approaching 8:00 pm so we walk around the lagoon to our usual spot between Norway and Mexico for Reflections of Earth. India and Georgia want to ride Test Track, so off they go while I sit on the rail and Tam gets nachos and a beer form Mexico. This is nearly as bad as the UK at $6.50 for a 20 oz Dos Equois (sp?) but beggars cant be choosers at this time of night. It slowly gets dark and the torches bathe World Showcase in their fiery glow. The girls return and Georgia and I rush off to get churros and another beer before the show. I have written this so many times before that I am desperately trying not to be boring here, but I cant help but repeat myself. As the music swells in the middle of Reflections of Earth the hairs on the back of my neck stand on end and I stand grinning at the wonderful sight before me. Does this show ever lose its thrill? After the show we do our usual trick of remaining behind to let the crowds clear. Eventually the old Tapestry of Nations music starts and India comments on this. A chap standing nearby says You guys have made my day, you actually know this music. It turns out that he is a CM who used to perform in the Tapestry parade. Well, thats it! We are there for the next half hour while we talk to him about his job. He currently works in the snowglobe parade in the Magic Kingdom and has also been a puppeteer in the Legend of the Lion King and played Clopin in the Hunchback show. He tells us some really interesting things that I couldnt possibly tell you about. Oh all right then, if you insist. One thing he says is that there is a rumour that Spectromagic will be leaving to go to Disneyland Paris to be replaced by the current Tokyo Disneyland night time parade. I also ask him lots of questions about working for Disney, the hours he has to work etc. Hes a lovely bloke and by the time weve finished talking theres virtually no one left in the park. Thats just the way I like it. We walk slowly round to the International Gateway. I dont suppose we come across more than 5 or 6 people the whole way round. It really is a magical time. Epcot at night is not pretty, its not nice, its not pleasant, its beautiful. I want an E-ticket night in Epcot that runs from 10:00 pm to 2:00 am with music and dancing and only a couple of thousand people allowed in. Id pay a lot of money for that. Back at the Beach Club we drop in at Beaches n Cream as we know that Mark, Mandy and Astrid are returning there after their illuminations cruise. Once there it would be rude not to have anything, so the 4 of us attack a Milky Way Sundae and enjoy one of the few bargains on Disney property  a 99c bottle of Coke. The other group has just started on a Kitchen Sink as we leave, so we say goodbye as its unlikely that we will see them again before we go home. Dammit! I said the h word! Now Im upset. A bottle of beer to drown my sorrows and Im off to bed to dream of being a monorail driver.